There’s magic in our world at every turn. It glimmers at us from the horizon, and even wild storms have their own kind of magic. At least, they do in Shakespeare’s play, “The Tempest,” which opened on Thursday at 7:30 p.m. in Freedlander Theatre. “The Tempest,” Shakespeare’s final solo play, tells the tale of the sorceress Prospero and her daughter Miranda, who are exiled for 12 years on an island that is home only to monsters, sprites and spirits. Though Prospero was originally written as a male character, he does not need to be played by a male, one of the positive flexibilities of Shakespeare’s play. At the start of the play, Prospero conjures a fierce tempest, which wrecks a ship and strands the passengers on an island. As the bewildered castaways begin to explore, the plot unfolds into “a farcical fantasy ride of tempestuous sea storms, romantic discoveries, slapstick buffoonery, revenge and forgiveness,” as described by the theatre department on its website page. 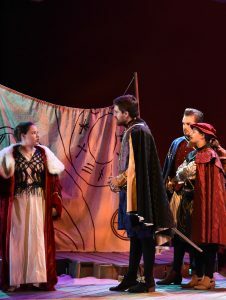 According to Professor Shirley Huston-Findley, theatre department chair and director of “The Tempest,” the College has not produced a Shakespearian piece for many years. “I am particularly drawn to ‘The Tempest’ because it provides some interesting staging challenges, as well as topical themes we can’t ignore,” she stated. One such theme is that of colonialism, which appears several times throughout the play. Dante King ’21, who plays Gonzalo, an elderly man who aided Prospero in the past, said that he found this aspect very interesting. “Prospero is kind of lord over all, and he does have subjects, most of which are magical creatures that he found on the island. I guess that makes the show magically educational,” said King. Megan Fisher ’21, who will be playing Ceres, the goddess of wheat, agrees that she is excited to see the play open. “Everyone is so dedicated to the craft, and everyone keeps the mindset that every role is important,” she said. What really strikes her about the production is the sense of magic that is threaded throughout. “I think the theatre department has really tried to focus on [magic] in their rendition of this show, and I think that people can take away that magic to enjoy, even in their everyday lives,” said Fisher. Huston-Findley said that over 70 people are involved in the making of this production. When asked why people should attend, she responded, “Scientific studies show us that attending live theatre productions improves our capacity for tolerance and empathy, increases critical and creative thinking skills, benefits our overall mental health and, of course, adds to our literary knowledge.” Go for magic, for knowledge or for a story; you will find all three onstage at Freedlander. “The Tempest” is open three days, running from Thursday, Oct. 25 through Saturday, Oct. 27. Each performance is at 7:30 p.m. in Freedlander Theatre. Admission is free for C.O.W. students, $6.00 for staff, non-C.O.W. students and seniors and $9.00 for the general public.